← Caught in the Glow release day! I’m excited to be revealing the final cover and description for book 3 in The Glower Chronicles, Caught in the Dream, today! Mateo Jimenez is haunted by the death of his first girlfriend, and his fear of repeating past mistakes has cost him personal relationships and now his job. While his colleagues protect L.A. from the demonic Glowers, he’s been demoted to office work. So when a Glower approaches him to negotiate a ceasefire, Mateo agrees to listen, planning to gather information on the demons that will prove his worth. He isn’t prepared to be so tempted by Kess, who uses her supernatural talents to bring his most buried desires to life. As he struggles to keep the upper hand, he discovers he can provoke human emotions in the demon, but the more warmth and kindness Kess offers, the more confused his own feelings become. No longer sure what’s an act and what’s real, Mateo sees a chance to stop the Glowers for good. But first he must decide whether trusting Kess is the key to succeeding or the greatest betrayal he could ever commit. 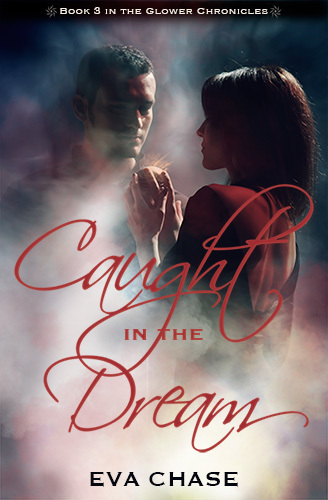 Caught in the Dream will be out March 29th, and it’s available for pre-order now!